Ideelt plassert for de umiddelbare lokale fasilitetene til Earls Court, tilbyr denne fantastiske ettromsleiligheten fabelaktig levende og underholdende innkvartering. Nyrenovert 1-roms leilighet beliggende i Earls Court Road i Kensington & Chelsea borough, sone 1 tilbyr utmerkede transportforbindelser hvor som helst i byen via Piccadilly og District linjer med overground også i nærheten. Vakkert presentert med nøytral innredning gjennom. Sjenerøst mottak rom med god plass til å spise. Leiligheten består av et dobbelt soverom (13 kvm) med store innebygde skap, dobbeltseng og et studiebord med stol, stort resepsjonsrom (24 kvm) utstyrt med en komfortabel dobbel sovesofa for ekstra soveplass, spisebord og modulær enheter for lagring eller hyller. Den semi-åpen kjøkkenløsning er fullt utstyrt med alle integrerte apparater. Moderne WC / dusj med takvindu. Leiligheten drar også fordel av laminert tregulv, doble vinduer, inngangs-telefon, gulvvarme, air condition og flatskjerm-TV. Denne romslige leiligheten ligger i andre etasje mot den stille baksiden av bygningen og drar nytte av generøst naturlig lys. Denne flotte leiligheten ligger innen rekkevidde av de viktigste tunnelbanestasjonene, og tilbyr utmerkede transportforbindelser dag og natt samt svært trygge områder for å bo i og nyte London. Leiligheten har et moderne utseende med nøytral innredning gjennom. Store doble glassvinduer par med stoff gardiner gir varm følelse. Energieffektive spotlights gjennom hele leiligheten med lysdemper. We had a grand time while visiting London and found this apartment the perfect spot to start each day of our visit to UK. The location was central enough but not right in the of center of London to get a feel of Kensington as well. We found fabulous restaurants right outside our door and the Tube was literally straight across the street allowing easy access to everything. Thanks for the great accommodations and we will definitely spread to work to our friends and family for future travel. Clean nice Apt , easy access to everywhere . Vivian was open to take our tips and suggestions to make the most of her stay. She is also a host back in Oregon and she appreciated our comments. Your comments are much welcome as we aim to make every guest experience a little bit better. We are pleased when our guests get to enjoy their stay in town having while having our apartment as a base to stay. Every comment from guest is welcome as it would help us to improve our future guests experiences. Happy to assist our guests in town! The apartment was clean, bright, and well-equipped. Comfortable bed and plenty of room. The location was fabulous -- you can take the tube from/to Heathrow and it's a two-minute walk to the flat (just across the street from the tube station). Which makes it very convenient to almost everything else in London, of course. Even though it's on a busy street the apartment is in the back of the building and we weren't bothered at all by street noise. You do have to be willing to climb some stairs, but the closeness to the tube station more than made up for that. We'd love to stay here again on our next trip to London! Great flat in great location! Flat was very centrally located and was spacious and clean. Turned out to be perfect for our stay. It is well equipped and surprisingly large for the area. Being at the back of the building meant it was really quiet and we heard no street noise at all. It would have been nice to have seen the owner/landlord at some point during our stay (all communication happened via email) but other than that we only have positive things to say about this accommodation. Would be very happy to recommend to friends and to return in the future. Great Space! Great Location! Great Value! This unit in the heart of Knightsbridge was clean, airy with easy access to restaurants and services, especially the Earl’s Court Tube station right across the street. The suite was thoroughly modern with state of the art appliances including a large fridge/freezer, dishwasher, washer/dryer combo, oven/cooktop and HD television with multiple channels. Furniture and bed were comfortable with lots of space in living/dining room and cupboard space in bedroom which had comfortable queen size bed. Lots of windows which open onto open spaces with lots of light. Met Fabio when we arrived and he was able to provide valuable information about the area and suggestions as to what to do in London. 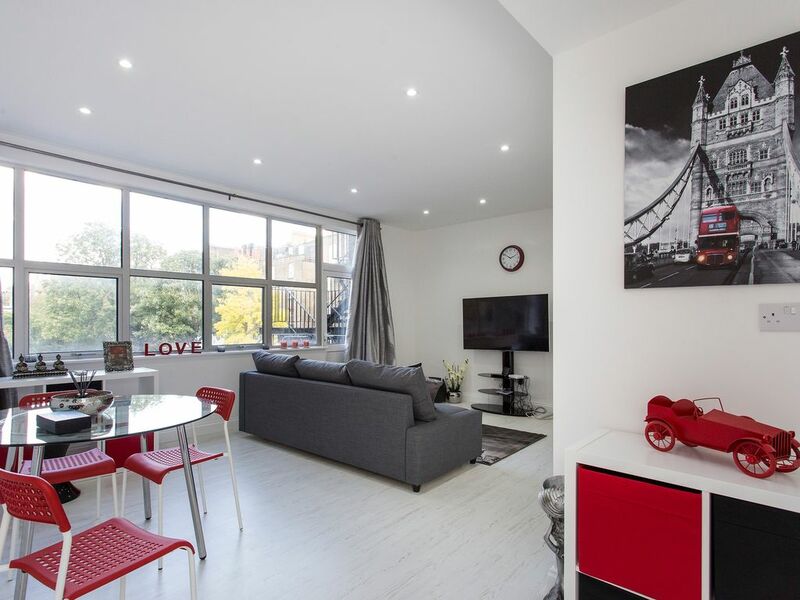 All in all a great location for a couple or family to stay in the heart of London. We will surely try to book again next time we visit. Thanks to all our guests who in one way or another have contributed to enrich our guest experiences with their feedback and comments. The apartment is truly comfortable and set in a prime location where guests find convenience, vibrant area with charming gastro pubs and restaurants. Happy to make every trip special!! Foruten sin plassering i et av de mest kjente nabolagene - og ikke langt fra Londons sentrum - vil du holde deg nær flere kjente steder, for eksempel Natural History Museum, Victoria og Albert Museum, Science Museum, alle med gratis tilgang, ikke til nevne shoppingdistriktene på Kings Road og Harrods i Knightbridge. Åpen skogsområde ligger bare en kort spasertur unna med Holland Park, som tilbyr 22,5 hektar hager, lekeplasser, idrettsområder, en kafeteria og store skogsområder rikelig med dyreliv, et flott sted å holde barna underholdt. Innenfor parken er den vakre Kyoto-hagen; en japansk hage donert av handelskammeret i Kyoto i 1991. Themsen er innen rekkevidde, hvor promenaden og Thames-banen tar deg gjennom noen av de mest pittoreske severdighetene, samt noen av de beste puber og restauranter i byen.